Education: Point Park University, BFA Musical Theatre, Class of 2013! 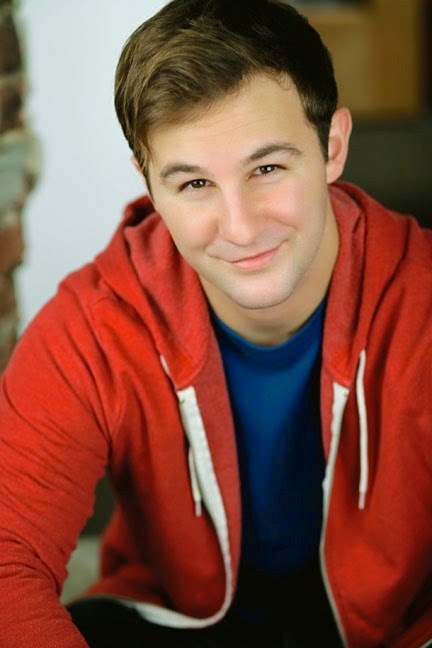 Select Credits: CBS' "As the World Turns", The Music Man (Northshore Music Theatre), The Crucible (John Proctor, Pittsburgh Playhouse Conservatory), RENT (Roger, Riverdale REP). Why theater? : I grew up in a family of theatre folk and I guess I just got bit by the theatre bug! It actually hurt and I still have a scar from the bite. Dad (Bob), mom (Laurie), sister (Emily), and Uncle (Jim) have all been on broadway and doing their own theatre things my entire life. I was sure I was going to be different, though, because I was the baseball player of the family. But during a high school production of Oklahoma!, it just hit me. I think I was singing about a Surrey with something on top of it when I realized that there was nowhere else I wanted to be and nowhere I felt more comfortable than on that stage. As cliche as it sounds, I just felt so at home. I tried to be crazy and pursue both baseball and theatre in college but it didn't work out and when it came down to it, I just couldn't stay away from the whole acting thing. Who do you play in Fable? : I play Tucker. A goofy, sarcastic, charming, loud, honest, and downright lovable young partier who has decided to live at home after high school and not rush into the college life. I'd say he's my favorite character in the show! Tell us about Fable: Fable is a story about growing up, friendships, first loves, first times, secrets and trying to find the path in life that is right for you. It's the night of High School Graduation and we meet 6 friends that are doing their best to survive it. This could very well be the last night that these 6 are in the same place at one time and they are forced to talk about things and confront situations that they never have before. We meet this teenagers on the brink of adulthood and it makes you wonder and question all those stories and lessons we were taught as kids. Fable reminds you that life never stops changing, whether you're ready or not. It's a beautiful, realistic story with characters that everybody will be able to relate to. It also has such an incredible, contemporary score. It's great! What is it like being a part of Fable? : I couldn't be more excited to be making my NY debut with this show! Even though we just started rehearsals, I can already tell we have a special group of people here. It's a gigantic team of incredibly talented and creative individuals. It's also such a relaxed and fun atmosphere which is super important when working on a new piece of theatre. We're all comfortable and having the perfect amount of fun while still getting our work done. As a cast, I can tell we already have so many similarities to the characters we are playing . That makes it easier to just breathe and be confident and just be you! There's also a great sense of trust in the room so we can just go for it and see what happens and not be afraid! I think everybody is going to watch this show and be like "Hey! I remember that feeling!" or "Wow that was literally me at 18 years old." It's awesome. What kind of theater speaks to you? What or who inspires you as an artist? : Ooooh that is a tough one! I really love all kinds of theatre. That's kind of a boring answer but it's true! I love August Osage County and In The Heights equally but they are rather different! I will say that after doing Twelfth Night at school, I've become obsessed with good ol' Billy Shakes. Obviously, Shakespeare is the most influential playwright and poet who has ever lived. His plays are timeless, he writes about real people that you can identify with, pretty much everybody in the universe can throw out a quote from something of his, and as an actor, everything is in the language. You can just let the words flow and pour out of you. The words do everything for you and there's nothing like it. I <3 Mr. Speare. As for artists, there are many that have inspired me. From Michael Jackson to Leo Dicaprio to Dustin Hoffman to Norbert Leo Butz to Meryl Streep to Steven Sondheim to Queen to Billy Joel to my Mom and Dad! There are many! Any roles you’re dying to play? : I would do anything to play Hamlet and I would do anything to play Billy Bigelow. Maybe someday!? I'd also love to play Usnavi and Mama Rose but I don't think those will ever happen. What’s your favorite showtune? : I'd say my favorite show tune is "Being Alive," from Company. If you could work with anyone you’ve yet to work with, who would it be? : I would love to do a show with my big sister, Emily. She's the most talented person I know and I just want to be able to act with her. Now that we're both kind of adult people and working actors, that would be amazing. Cast us! Who would play you in a movie about yourself and what would it be called? : If Ryan Gosling were available, he would definitely get the call. And I would call it "The Young Baseball Playing Actor Who Only Eats Sushi." It's a dramedy also starring Amy Adams as the love interest. I'm also trying to get Paul Rudd for the best friend role. We'll see what happens. What show have you recommended to your friends? : "Breaking Bad" and "True Detective" forever and always. What’s the most played song on your iTunes? : "The Way You Make Me Feel" by MJ, the king of pop. What’s your biggest guilty pleasure? : The 2001 teen comedy "Get Over It", starring Kirsten Dunst, Ben Foster, and Martin Short. It's a good one. What’s up next? : Hopefully this will be the first of many opportunities I have in the big city. For now I'm just going to keep on auditioning, meeting people, and having fun! Enjoy the show!